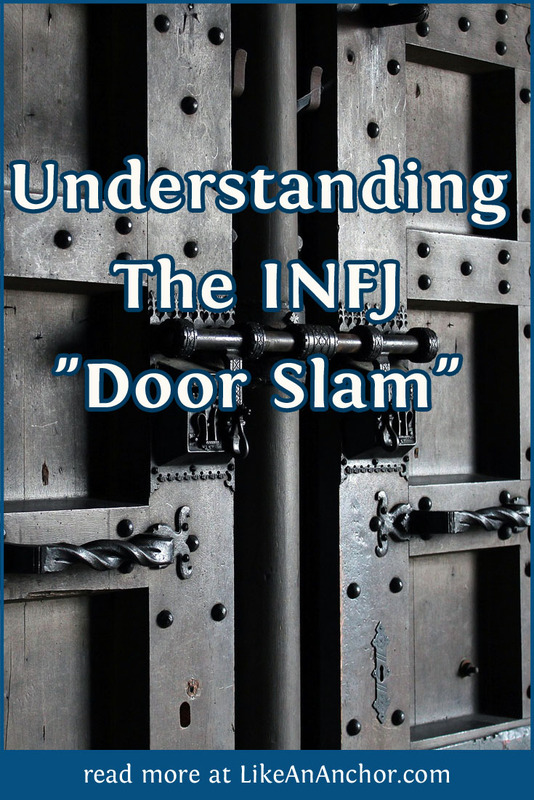 Shutting people out of your life after they’ve hurt you or someone you love isn’t specific to INFJs, but it happens often enough that we’ve given it a name: The INFJ Door Slam. I like the definition given in an article by Jenn Granneman titled “How INFJs Deal with Conflict: 10 Confessions” (which is no longer available online). An INFJ door slam may or may not involve actually cutting a person out of your life. Depending on the circumstances, a door slam can range from ignoring someone completely, to limiting contact to the bare minimum, to acting almost normal. In some cases the person who’s been door slammed can’t help but notice, while in others they don’t realize anything has changed (though something definitely has, at least in the INFJ’s mind). INFJs are typically tolerant, understanding, and patient. We hold ourselves to a strict code, but we don’t expect most people to adhere to that code and we’re understanding of individual choices and personality differences. The closer you get to an INFJ, though, the more we expect from you. In our close relationships, we expect a certain level of trust, commitment, and commonality (which is something every type is looking for, to be honest). A door slam rarely happens to casual acquaintances. There’s no point in “door slamming” someone who has never been close to you. Door slams happen when we’ve poured energy into a relationship and just can’t keep doing that. If the relationship turns into a one-way energy drain that’s hurting us emotionally, then we’ll reach a point where we cut off contact. Usually there’s a build-up to this in the INFJ’s mind, but it may not be apparent to the other person until the INFJ starts distancing themselves from the relationship. If you’re an INFJ on the giving side of a “door slam,” make sure you’re not shutting people you care about out of your life simply because you hate conflict. Sometimes slamming the door on a relationship is good for you, sometimes it’s not. Knowing the difference is a key to healthy relationships. If you’re on the receiving end of an INFJ door slam, know that it’s a symptom of much larger problems in the relationship. Rebuilding the relationship after an INFJ has cut you off is possible, but it’s not going to be easy. It will require lots of honest communication over a period of weeks, months, and perhaps even years depending on what happened. You’ll also need to be prepared to give the INFJ space. Trying to intrude on them right after they door slammed you will only make them want to add locks to the door. What are your experiences with an INFJ door slam? Hi Marissa – I have read this in a few different places, and I’d be curious to know what an INFJ doing “just about anything” to keep a relationship looks like. I have a female INFJ acquaintance that I have know for more than 5 years, and she has slowly be surely opened up to me more and more over that time to the point that I am sure she now shares more with me than she does with even some of the people that she considers to be her “friends”. (She doesn’t consider me to be a friend). But despite our close connection (I’m an INTJ male, by the way), she NEVER initiates contact with me, and I am certain that if I didn’t keep in touch with her, we would probably never see each other again. So even though I feel like she has “let me in”, which makes me feel privileged and special in some ways, I don’t feel like she does (or would do) anything to keep our relationship going. In relationships that INFJs highly value, “doing anything” to keep the relationship going means the INFJ is actively pouring energy into maintaining the relationship. This includes initiating contact and/or making sure we respond to every one of their communications, going out of our way to make the person we care about happy and to spend time with them, and down-playing possible disagreements to avoid bringing conflict into the relationship. Your INFJs friend probably really enjoys talking with you – I love taking with INTJs. Our types think similarly enough that INFJs feel understood when communicating with INTJs, so that’s probably why she shares more with you than with some of her other friends. In your particular case, I’m guessing the fact that you’re married does play a role in her reasons for not developing a closer friendship with you. She might be hesitant to instate contact with you because she doesn’t want to encourage further emotional intimacy with a married man and is concerned about what other people might think. Personally, I’m very hesitant to maintain a close friendship with a married man, especially if he’s close to my age. I could have provided more details before, but I wanted to get your unbiased insights first. My INFJ told me last year that while she very much enjoys spending time with me, (1) she has to be careful about spending too much time with married men because she has to be aware of what other people think about the intimacy of the relationship, and (2) she didn’t know how my wife felt about us spending time together and didn’t want to “impose”. So I guess your line of thinking matches up very closely with that of my INFJ. The thing is, I respect her a lot for respecting my marriage, and I wouldn’t be comfortable spending time with her if she didn’t. I am fully committed to my marriage and don’t want to do anything to harm it. The challenge is that my ESFJ wife simply can’t provide the kind of brain stimulation that my INFJ can, and I miss that stimulation when I haven’t had it for a while. My INFJ has told me that she likes our conversations a lot as well, and we have shared a lot of enthusiastic chats over nerdy academic subjects of mutual interest. One of my best friends is an ESFJ, and the other ESFJs I know are awesome people. But yeah, I don’t really talk to her about nerdy academic topics or anything theoretical — it’s just not her area of interest. I talk to my INTJ sister about things like that. I suppose ideally it would be nice if you could find a couple other friends who can stimulate your brain and talk about nerdy interests so you’re not spending all that time with this one INFJ, but I know that’s much easier said than done. It’s hard to track-down like-minded people you can actually have real conversations with. Best of luck to you, and let me say how much I admire your commitment to your marriage. 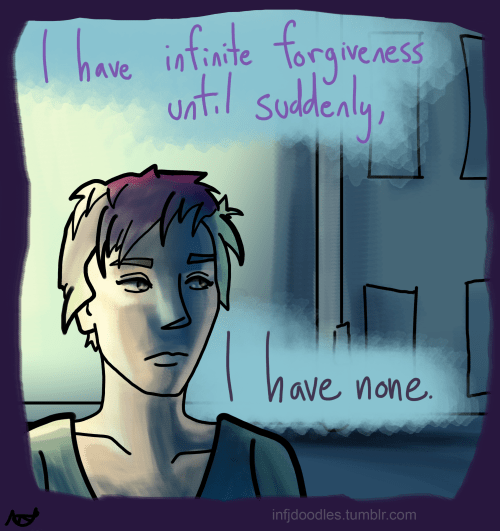 Reblogged this on Give me space. In the INFJ friendships I’ve seen it seems to be an all-or-nothing deal. Either they do everything with you and tell you all their deepest, darkest secrets or they simply aren’t friends with you. Is there any way to get just a casual INFJ friendship? I do have a few people I consider more casual friends. Usually they’re people I enjoy running into at church-sponsored events or (before I graduated) at college. We don’t really keep in touch in between seeing each other, though. If you want a casual friendship with an INFJ, you’ll most likely be the one initiating your contacts with them. One of the problems you might have in developing casual friendships with INFJs is the fact that we tend to limit our social interaction with people we don’t know well. We have a limited amount of social energy, so we usually spend it on the people we’re already close to or people we’re interested in letting into our close friend circle. We’ll chat with other people when we run into you or if you reach out to us, but rarely bother keeping up casual friendships. Wow, that really makes us sound rude, doesn’t it? we’re honestly not trying to be mean. Makes sense. I can follow the train of thought. ISFJ here, so I’m big on “make everyone comfortable” “all friends must feel equally loved”.